Celebrate America’s birthday with the cake it deserves! Note: This is a special project recipe with lots of opportunity for learning (key baking concepts, math skills, patience). While the process itself is actually quite simple, it takes some time to prepare, bake, and cool the five pans of cake. We suggest making the cakes a day ahead of time and then assembling them the next. Preheat the oven to 350°F. Grease two 9-inch cake pans and insert a piece of parchment paper cut perfectly to fit the bottoms. Set aside. Make the white cakes: Sift the flour, baking soda, and salt into a large bowl. Set aside. In a stand mixer fitted with a paddle attachment (or using a handheld mixer), beat the butter and sugar on medium-high speed until combined into a crumbly paste that’s almost white in color, about 2 minutes—scrape the sides and bottom of the bowl with a rubber spatula as needed. Add the oil, vanilla, and vinegar and mix on medium-high until combined, scraping down the sides and bottom of the bowl as needed, about 2 minutes. Adjust the mixer to low speed, then add the dry ingredients in three additions, alternating with the buttermilk, beginning and ending with the dry ingredients. Mix each addition just until incorporated, as overmixing will cause the cake to be tough. In a medium bowl, whisk the egg whites until thick and foamy, 2 to 3 minutes. Fold into the batter with a rubber spatula. Pour the batter into the prepared cake pans, filling about two-thirds full. Bake until the tops of the cakes spring back when gently touched and a toothpick inserted in the center comes out clean or with moist cake crumbs rather than wet batter, about 28 to 30 minutes. Remove from the oven and set on a wire rack to cool completely in the pans. To unmold the cakes, first run a butter knife around the edges. One at a time, place a piece of parchment paper over the cake and set a large round plate upside down over the top of it. Leaving the parchment circle on the bottom of the cake, invert the cake onto the plate and then flip right-side up onto a cutting board or clean countertop that’s out of the way. Make the red cakes: Use the directions for the white cakes, except add the cocoa powder with the dry ingredients, and add the egg yolks (only) and food coloring to the wet mixture at the same time as the oil, vanilla, and vinegar. The baking and unmolding process is the same. 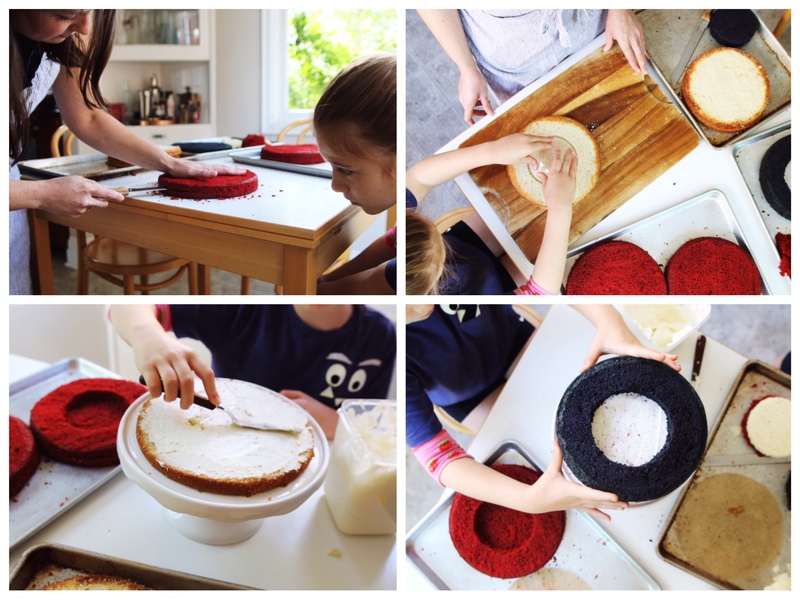 Make the blue cake: Use the same process as the red cakes. Make the frosting: In a stand mixer fitted with a whisk attachment (or using a handheld mixer), beat the cream cheese and butter together on medium speed until smooth, about 2 minutes. Add the confectioners’ sugar and 1 tablespoon of cream. Beat until creamy and very smooth, about 2 minutes. Beat in additional cream as needed until it reaches a spreadable consistency. Prepare the cakes for assembly: Using a large serrated knife, trim a thin layer off the tops of all 5 cakes to create a flat surface (your end goal is for the cake to remain level as you stack the tiers). If desired, trim away a very thin layer from the bottoms of the white cakes to remove the brown crust. Next, cut the 2 white cakes and 2 red cakes in half horizontally to create 2 even layers each, 8 layers total. Leave the blue cake whole. Choose a small bowl with a rim 4 to 4 1/2 inches in diameter. Place the bowl rim-side down in the very center of one of the white cakes. Use a paring knife to cut around the bowl, creating a small circle. Repeat with one of the red cake layers. (Discard the outer rings of white and red cake, as well as the additional unused half-layers, or use them to cut out stars for another treat or make cake pops!) Use the bowl to cut the thicker blue cake in the same way, but this time keep the outer ring of cake and discard the center. Assemble the cake: Place one white cake layer on a cake stand or large serving plate. Using an offset spatula or butter knife, evenly cover the top with a very thin coating of frosting. Place a red cake layer on top and add another thin layer of frosting. Repeat with another white and red layer for 4 total frosted layers. Place the thick blue ring on top. Spread a thin smear of frosting on the small circle of white cake and then top it with the small red circle. Place this combo inside the center of the blue ring, white cake on the bottom. 16. Add the remaining frosting to the cake. Decorate with fresh berries or sprinkles if desired. Cut slices, congratulate yourself for being awesome, and enjoy!